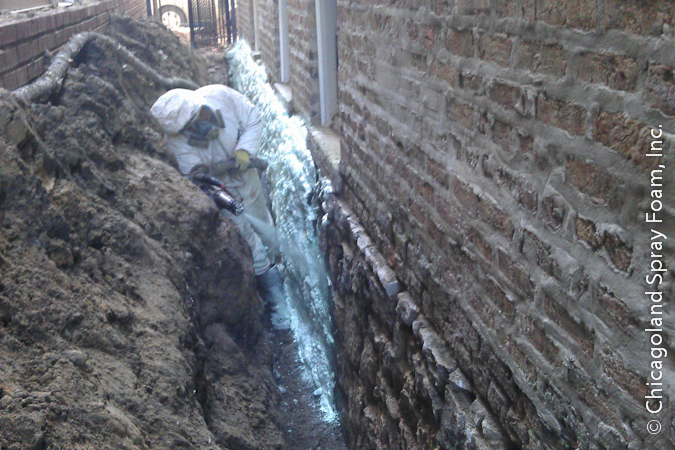 Waterproofing an old limestone foundation from the exterior with “Closed Cell” spray polyurethane foam provides a water tight seal from the outside. Closed cell spray polyurethane foam provides more than 3x the waterproofing and 4x the compressive strength of Extruded Polystyrene (EPS) which are the pink boards sold at Home Depot, Menards, Lowes, etc. These pink boards allow water to permiate through them reducing their thermal efficiency and letting water through. Closed Cell when applied to a crawlspace or basement wall is sprayed seamless so no water is able to penetrate. So why is this important? Like clothing when wet, it does not insulate nearly as well. In applications below grade, there is nothing but moisture and ground water saturated in the soil. Closed cell spray polyurethane is the only logical answer for a seamless waterproof insulation. What is crawl space encapsulation? 10 things you should know before you begin! What is R-value for Spray Foam Insulation vs. Fiberglass Insulation? How Much Money Does Spray Foam Insulation Cost? My wife and I purchased a rehabbed 100-yr-old house in Logan Square. The house had a ventilated, un-insulated, dirt-floored crawl space with no insulation beneath the first floor. This essentially meant that on our first floor, the only thing separating our feet from outdoor air temps was a layer of sub floor and the hardwood flooring. As the temps dropped, the first floor turned into an ice box and our heat ran non-stop. I contacted several of the big national crawlspace “experts” for consultations and estimates. None of them could provide a cost-effective and workable solution. It seemed that anything other than newer clean concrete crawlspaces left them befuddled. Then I contacted Chicagoland Spray Foam. Jeff promptly returned my request for an estimate and actually came to the house that same evening. He inspected the space and patiently explained our options and offered advice. The difference between this consultation and the others was like night and day. As someone who’s worked in a different realm of contracting for the past decade, I have a relatively well-honed BS detector, and Jeff’s advice came across as both honest and exceptionally knowledgeable. He then followed up promptly with an emailed quote and a thorough, written explanation of what we should do and why. Our house has never felt warmer, we no longer have drafts that would give us the chills. We don’t have to wear slippers in the morning either 🙂 . If that wasn’t enough, we’ll make back the money we spent on the spray foam insulation with our utility bill savings in about 18 months. We couldn’t be happier, Thanks for a job well done Chicagoland Spray Foam. Goodbye drafts! Chicagoland Spray Foam sprayed an area we were remodeling which had a huge draft problem. Chicagoland Spray Foam brought out a thermal imaging camera and found all the places that were concerns and others we didn’t even know about. We had them do a blower door test before and after which was well worth the money to find even more problem spots in the original part of the house.Long story short, the area that was spray foamed is super comfortable and the blower door allowed us to seal up additional areas. Our house has never felt more comfortable. We look forward to getting them back to spray foam some additional area soon.I would recommend them highly as they have the knowledge and equipment to explain all the ways to save money in the short and long term. Open Cell Spray Polyurethane Foam Insulation cell structure is open and usually weights .5 lbs per cu. ft. and has an aged R-value of up to R-3.81per inch. Open Cell foam ideal applications are walls which have cavities that have 3.5" of available space. The underside of roofs in an attic space is another ideal place for open cell foam, this creates a conditioned space in your attic and eliminates high temperatures that cause extra load on your HVAC system. Closed Cell Spray Polyurethane Foam has a closed cell structure and is much denser weighing 2.1 lbs per cu. ft. and has an aged R-value of up to R-7.4 per inch. Closed cell foam idea use is in place where water contact may become an issue at some point like a crawlspace, basement, under slab, or an exterior application. Closed cell is also idea where greater R-value is needed in a tighter space like a masonry wall with 2" furring strips or cathedral ceilings with limited rafter space. FEMA has determined that closed cell spray foam is an acceptable material to use in a flood zone with continuous contact with flood water without the need to be replaced, Fiberglass is NOT. -Less Weight: won't cause resettling like cementitious grout. -Non-shrinking: won't shrink like grout causing settling. -Faster return to use: cures in 15 min. allowing re-use sooner. -Lifting Structures: can be used to lift buildings and stabilize soils unlike grout. -Environmentally friendly: water used in grout contaminates soils. High pressure crack injection uses hydraulic machinery to inject urethane into cracks at pressures reaching 3,000PSI unlike most contractors who use a caulk gun to inject epoxy at 15 PSI. High pressure crack injection can be used on active leaks, even ones with water literally streaming water from the crack. © 2019 – Chicagoland Spray Foam, Inc.